Antonio D’Amico was sipping coffee on the veranda close to the entrance of his Miami Beach home when he heard the shots. It was around 9am and his boyfriend of 15 years legendary fashion designer Gianni Versace had briefly left the couple's Ocean Drive home to buy a newspaper at a nearby cafe. Usually, Versace would have an assistant walk to the coffee shop to receive his morning papers, but on this morning he was in high spirits and took the chore upon himself. He was putting the key in the door lock when he was shot twice at point blank range, once in the face and once in his neck behind the left ear. “I felt as if my blood had turned to ice,” Antonio said . He and Versace’s butler went outside to investigate. “The house had stained glass windows so we couldn’t see what had happened from inside, so we had to open the gate. The murder shocked the world. 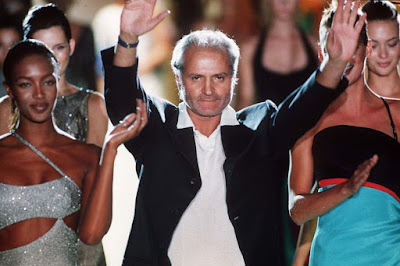 Versace, the charismatic designer whose clothes were coveted by millions, had been at the height of his powers. Just days earlier he had celebrated the launch of his latest collection in Paris. Now he was dead, bleeding out on the steps of his mansion as his lover watched. At his side was a dead bird and it was this, the sign of a contract killing, that made police believe his murder might be a mafia hit. However, it quickly became clear that the bird was just an unfortunate coincidence. It was the actions of his friend Lazaro Quintana, who was also at the mansion that morning, that helped cops find the designer's killer. After hearing the shots, Lazaro went out into the street and spoke to a woman who pointed him in the direction the gunman had gone. He followed him for several minutes until the killer threatened him with the gun. Lazaro ran for help and police tracked the man to a nearby garage. Inside they discovered a pile of clothes, a truck that had been reported stolen in New Jersey, and inside the truck were documents. Thanks to Lazaro's brave actions within three hours they had a suspect. And what a suspect he was. 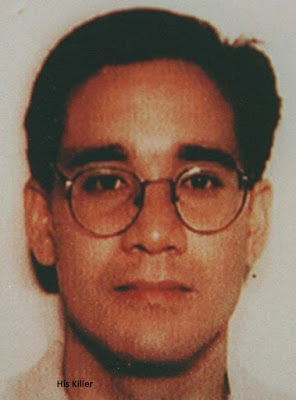 Andrew Cunanan was a 27-year-old gay man who had murdered at least four other people in a three-month killing spree before turning up at the fashion designer’s home. When police ran his name through their records it turned out Miami Beach Police Department was not the only one looking for him. Cunanan, a former popular high school student with a genius level IQ, was wanted in connection with four other murders. No one knows for sure what led him to make Gianni Versace his next victim but friends of Cunanan said he always wanted to be famous. "I don't know that we are ever going to know the answers," said Miami Beach Police Chief Richard Barreto at the time. He had pawned a gold coin stolen from his last victim but the police had not followed up the report and he was checked in to a downmarket hotel under his own name. Yet for nine days Cunanan avoided the police. It was only when someone spotted a break-in at a houseboat 40 blocks from where Versace had been shot that they had their breakthrough. Police special forces, including helicopters, boats and dogs, surrounded the houseboat and a telephone was sent in as negotiators tried to establish contact with the murderer. But when a shot was heard after a four-hour siege, the SWAT team fired tear gas and went on board. Cunanan's body was found on a bed. He had shot himself with the same gun he used to kill Gianni Versace, William Reese and David Madson; the gun he had taken from his friend and first victim, Jeff Trail. Versace's body was cremated and his ashes returned to the family's estate near Cernobbio , Italy, and buried in the family vault at Moltrasio cemetery near Lake Como. Princess Diana travelled to Milan for his Memorial Service Versace on July 22 1997, along with Elton John and dozens of stars from the fashion world. Today his business is still thriving with his sister Donatella at the helm.